In the 1950’s and 60’s, “Space Age Bachelor Pad Music” (the term wasn’t in vogue at the time) was also boasting the sounds of Mexican lounge king Juan Garcia Esquivel. 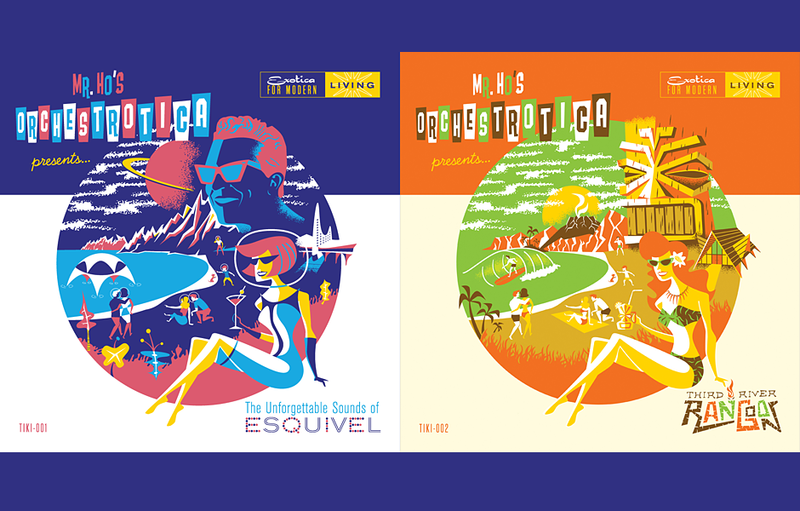 The new sounds in high fidelity were an experimental playground for arrangers like Esquivel and his zany mix of American pop, big band jazz, and easy Latin. “Compared to some of the other lounge music at the time, this music is anything but bland. Esquivel is spicy,” says Irwin Chusid, DJ and music historian. Fast forward to the early 1990’s when these music genres…exotica, lounge, space age pop…were “rediscovered”. For most listeners it was something new, something their parents or grandparents may have listened to. It became quite vogue at the time but like all “fashionable” things, it went out of fashion, but only in the sense of being fashionable. “For those who truly appreciated Exotica’s musical qualities, it never went away,” says Chusid, who is credited with the rediscovery of Juan Garcia Esquivel through his production of the two albums Space Age Bachelor Pad Music and Music from a Sparkling Planet. The second CD, just released, is strictly Exotica. In Third River Rangoon, Brian has stayed true to the Exotica masters but has also written new, original compositions. On Third River Rangoon, Mr. Ho’s Orchestrotica transforms into his small ensemble…a vibraphone quartet with a fifth member on oud. Using instruments from around the world in place of the some of the more classic exotica instruments, and adding in Tchaikovsky’s Arab Dance and Cal Tjader’s jazz waltz, this music truly takes on a global mashup of jazz, exotica, chamber, and world music. Brian O’Neill is a highly trained musician – a percussionist, vibraphonist, pianist, composer and arranger. He began early on with the group Waitiki who were playing exotica with bits of jazz elements added to it. After about 4 years as vibraphonist/percussionist, Brian left the group to focus on the Esquivel big band as a separate ensemble, pursuing his interest in creating the only 22-piece orchestra in the world that plays the true space-age bachelor pad sounds of Esquivel. He then later formed the small ensemble quartet under the same name, mainly focusing on writing and performing new interpretations of exotica. So what’s next in the series? I had expected a short answer of “oh we’re doing this next…”, but in fact he rattled off quite the list of ideas for the next albums which included the possibilities of a brazilian-focused album, a strictly percussion album using his “global” instruments which look towards eastern influences, or perhaps another quartet recording interpreting classical ballet music with the group’s unique exotica, middle-eastern, and afro-cuban sounds. It’s obvious this type of music is not fading away. And it seems Brian O’Neill has taken on the daunting task of keeping it alive. According to Irwin Chusid, “It’s not going away. It’s a living genre. Brian is helping it develop, evolve, and endure.” Perhaps it will become more global in style as Brian looks to the different instruments he uses today from around the world, how they interact and historically where they’ve come from, and then incorporating all of this into his “modern” exotica. While Brian is paying homage to the traditions, he’s also wearing many hats: pianist, composer, arranger, vibraphonist. And then to compose, perform, record, plus bring it all to market..that is a daunting task. Let’s hope he can manage it all…for our sakes. Brother Cleve is a legendary cocktail creator who graciously agreed to create a special cocktail just for this article to go with one of Mr. Ho’s newest CDS. For your pleasure. Amy Thyr is a designer, Tiki geek, mad for mid-century mod and adorer of Mai Tais. Buddy Love where are you?